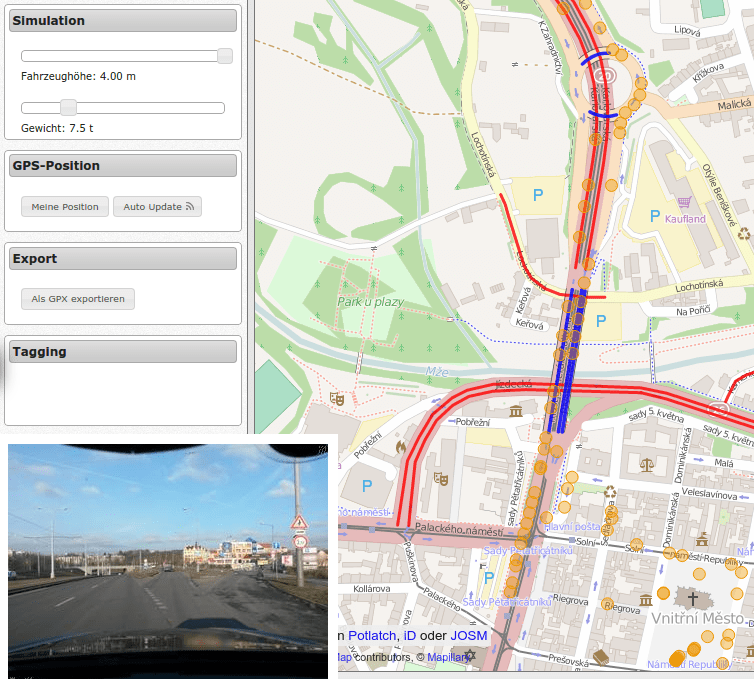 mmd has added a Mapillary window to the OSM Truck QA Map . This link explains how (English). You can click on the the yellow dots on the Mapillary images, and it is often possible to see the “maxheight” traffic signs and map them. Even the beginner-friendly online POI submitter YAPIS can now show corresponding photos from the Mapillary image service. User marczoutendijk continued his mini blog series – he writes about various things, including how to improve the OSM map. Part1 we presented in weeklyOSM # 242 and, Part 2 and Part 3 in issue # 243. Bryce C. Nesbitt wants to replace amenity=ev_charging by amenity=charging_station by a mechanical edit. On the mailing list Talk-GB the tagging of university facilities in Cambridge is currently an issue. The university uses OSM data as a key component of their own map and it is very detailed. Thorsten Alge proposes to the tagging mailing list to link to wikidata items instead of wikipedia articles. You can read more here about wikidata. There are also some comments on the OSM survey tool from Harald Hartmann as well. User Werner2101, an Ueber Mapper, shows how LibreOffice Calc can be used for the organisation of mappings. With a few macros it works particularly well. Robin Tolochko asks for help completing a survey on the organisation of Mapathons. She will give a lightning talk at SotM US in New York . OpenCage Data Blog introduces the Icelandic OSM community, the first officially recognised OSM “Local Chapter” worldwide. At Geometa Lab of the Hochschule Rapperswil, Switzerland, anonymised log files of OSM Tileserver were analysed. Osm.org now allows you to login via Facebook and Windows Live. Login via Google, WordPress, Yahoo and AOL has been possible for quite some time now. John Röskamp reports on a mapping party at the University of Ndjje (Uganda). User xunilOS reflects on the import of address nodes. The OSM community in Riga (Latvia) wants to import addresses. A discussion about a boundaries import in Nepal. It looks like the data that Rafael is planning to import may not be compatible with ODbL. From 6 to 8 June the State of the Map US takes place in New York. Unfortunately Video streaming will not happen but presentations will be recorded and published after the event. The disastermappers heidelberg write in their blog about their activities over the last few weeks. A promotional video of Kathmandu Living Labs. At the University of Oldenburg a 3D representation of F4 was used in the university’s own promo magazine, Uni-Info, to visualise the recently constructed new buildings. Nice rendered areas in OSM: The Zoo in Berlin, the “Herrenhäuser Gärten” in Hannover and the Zoo in Münster. Mapillary has updated their app for Windows Phone. MapBox announced MapBox Mobile for iOS (previously also known as “MapBox GL”). (Github-Repository). The Mapnik project (the rendering software used to render the many map styles in the OSM environment) thanked Blake Thompson and Jiri Drbalek for their extensive contributions to Mapnik 3.. The routing service MapBox Directions, which uses OSRM as a backend, now offers bicycle routing. … this isochronous map of Europe. The example shows the times that you need to achieve certain destinations by train from London (Ed: I suspect the frequency of cows on the line between Sheffield and Derby has not been factored in). TomTom remains data supplier for Apple Maps. Waze is now integrated in the Android App from Google Maps (English). Nokia’s “Here 360” blog reflects on the history of addresses. Verizon buys AOL (including Mapquest). Brian Timoney analysed the purchase with the view of geodata. Mapquest is closing its “OSM” department and dismissing its OSM developers, including Paul Norman. They will buy the services in the future from MapBox. Mitula buys Lokku. OpenCage Data, however, remains independent (previously belonged to Lokku).